At this point in my series on SmartGrid it is time to confess my background. I spent most of my 28 year career in the nuclear industry concerned with the design, analysis and operation of fuel and reactor cores. I always considered most of the rest of the system as plumbing designed to bring water to my domain. The turbine was a pinwheel on the far end of the machine. Albeit, a really BIG pinwheel. That pinwheel, its ancillary systems, and the generator are the main sources of potential operational issues associated with nuclear power. Each operating cycle of the reactor must be designed to tolerate generator load rejects, turbine trips, and a host of other anticipated operational events. So, why do I mention all of this in a discussion of transmission and SmartGrid? Because some of the most severe tests of my beautiful designs come as a result of grid failures forcing reactor shutdowns. Spending a few hours in SmartGrid bootcamp at the start of grid week gave me a much greater appreciation of the issues around transmission and how Smart Grid might alleviate some of those problems. During the rest of the week, I became convinced that much of the SmartGrid efforts and spend should concentrate on this area of the system. Current state of affairs in transmission vary widely from utility to utility depending on the vision and resources of the utility, the astuteness of the public utilities commissions (PUCs) or other rate setting commissions, and the demands of the consumers. In the worst cases, there is virtually no sensing or control devices and the grid is completely reliant on 19th century technology. Edison and Westinghouse could walk into those systems and recognize and operate them. Many utilities have installed SCADA, Supervisory Control And Data Acquisition, systemsthat allow some level of sensing and control. However, few utilities tie their SCADA systems together into a more coherent shole. Beyond SCADA improved sensing devices in the switch yards or along the high voltage lines to identifiy faults more quickly and prevent outages are almost non-exetant except in a few isolated cases. Sadly most PUCs are loathe to grant utilities rate incentives to upgrade this equipment unless a natural disaster or major power interruption makes it clear how critical such a system is. This is the first, and one of the most important, aspects of SmartGrid’s initiatives. By some measures the lower electricity losses of such improvements saves 3-5% of total electrical generation. Right on the heels of this initiative comes a second significant consideration for transmission. As I discussed in previous blogs, the grid was designed to work as a regional unit – most of the energy consumed in a region is generated in that region. The regions have very limited interconnection for transmitting power between them. The limited intertie allows issues to be isolated to one region and prevents blackout from spreading nationwide. In the days of limited sensing and automation, when the grid was first designed, these physical boundaries were the only practical way to isolate regions. However, if society continues to demand increase use of solar and wind, these regional grids will have to be much more strongly connected. 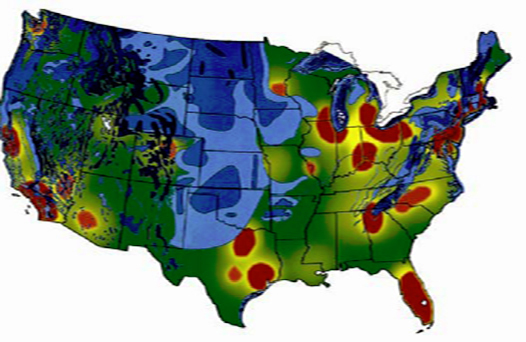 As the figure shows, for wind, the areas of the country with relatively good wind potential are geographically remot from the major population centers where primary consumption occurs. Solar is even more concentrated in the desert southwest. Even conventional power sources such as nuclear, coal and natural gas will need to leverage more closely inter-related regions. The US population has become increasingly wary of any industrial installations near population centers. As a nuclear advocate, I’ve seen the early development of this disease called NIMBY (Not In My BackYard). In communities where nuclear power plants currently operate the population has found them to be good neighbors providing jobs and tax revenue with no attendant air or water pollution. However, convincing new communities to allow construction of any major industrial facility is typically met with fierce opposition. Usually by people living near a proposed facility who fear loss of property value and some insidious pollution that they believe must come from any such facility. This opposition will drive conventional power facilities to less populated areas of the country and will require transportation of the resulting electricity across the country to the locations needing the power. Ironically, sighting of more high voltage lines also falls victim to NIMBY’s insidious disease. This will require astute and consistent government leadership at the national, state, and local levels and reslute and visionary utility executives to work together to make this happen. While the media has spent much time on the consumer end of SmartGrid, the issues identified here at transmission have much greater impact and are in serious need of balanced, clear reporting to help the public form educated opinions regarding installation of power plants, transmission switch yards, and high voltage lines in or near their homes and communities. Without the successful public private partnership to upgrade and expand out transmission facilities the US is in real danger of significant issues in delivering electricity to power our homes, our industry and our economy. I went into the GridWeek conference last week assuming that nuclear power advocates needn’t worry about all of these SmartGrid initiatives and that there was a great deal of hype about this that was overblown and not viable economically. I left with a much better understanding of some of the fundamentals of the issues around electricity across the country. AND a feeling that too much time and effort was being centered on the consumer end of the grid. Yesterday, I wrote an overview of the issues facing the electrical power industry in the 21st century. in the area of the grid. Today, I am going to pick on one aspect of the grid – power generation. While at first blush generation would not seem to be a part of the grid, it is the point at which the process starts. If the power being generated is unreliable or too slow to respond, nothing later in the grid can fix that. As discussed in my prior post, generation in the US works on a demand basis. That means that electricity is only generated when it is demanded. There is no direct storage of electricity, except in capacitor banks that give the grid operators time to spin up or down other generation options. That brings us to the first area that is encompassed in SmartGrid. There are other storage options, of course. The rest convert electricity into other energy forms more amenable to storage, like mechanical or chemical potential then convert it back. 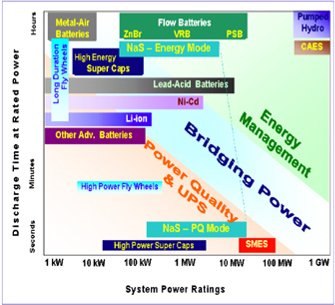 The chart below, from Secretary of Energy Steven Chu identifies many storage systems by relative power and duration. Most of these options have limited use today or are still in early stages of development and deployment. These storage options become even more critical when the renewable portfolio standards (RPS) recently passed by congress come into play. While solar and wind energy sources have successfully campaigned for their status as ecologically good electricity sources, the fundamentals of their technology add even more volatility to the electricity infrastructure today. For the moment, we’ll ignore the idea that end users might have solar panels or wind mills pumping power back into the grid and concentrate solely on industrial scale renewable installations, those generating at least 10 MW of electricity from one installation. Again, in Dr. Chu’s opening remarks at grid week he presented two charts that brought home the point about both solar and wind. 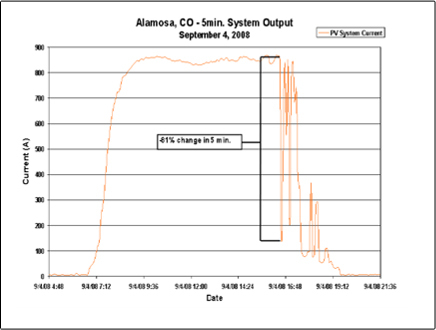 In the first chart, power generation from a solar array in Colorado is shown for a single day. I expected to see the first part of the curve. As the sun rose the power output of the panel increased to a fairly steady state peak with a few hours and was operating smoothly and predictably at that level. Easy to manage and providing power during the higher usage periods of the day, all good things. What happens in the mid-afternoon was something I had not appreciated before. Clouds, probably generated by the day’s heating began passing between the sun and the solar panels. These were scattered clouds, so as one passed the sun would again shine on the panels, This causes huge jumps and drops in the electrical output of this solar array. It occurs late in the afternoon, just when the demand on the grid is peaking; adding even more stress to an already burdened system. The second chart shows the projected impact on generation over the course of a typical week. I know, the chart is too small to read. Here’s a link to the original presentation. The critical observation here is that the more green you see, the more complex the energy response of other sources becomes. At even 11% renewables in the mix, coal (grey in the chart) begins to be forced to respond when the wind is generating too much power at a lull period. As the amount increases to 23 and 35% more and more complexity is called for. At 35%, even nuclear plants are required to modify operation. While proponents of solar and wind see this as a reduction in the use of coal and/or nuclear, the realities of the current response based system and the physics of spinning up or down the large turbines associated with base load coal and nuclear plants mean that, in reality the system is operating increasingly inefficiently. Coal and other carbon fuels is still burned at almost the same rate as before. The turbines are still spinning, they just aren’t putting electricity to the grid. This is where SmartGrid generation options come into the big potential pay-off. If the county really wants renewable energy sources, then using excess capacity during lower power demand periods to store energy that can then be siphoned off during high demand or low availability of so-called “green sources.” The scale of storage is far beyond anything currently on the grid in terms of both power and duration. Perhaps you’ve seen commercials like GE’s “If I only had a Brain”, but what does SmartGrid really mean? And more importantly, what does it mean for the average citizen? To answer these questions for myself, I spent last week in Washington, DC attending the SmartGrid conference. I was probably the only nuclear energy consultant in the room, but I believe that understanding the issues facing the industry in this arena are key to my industry’s ability to succeed. So What is SmartGrid? In the simplest terms, it is a broad set of initiatives around electric power delivery from generation to end-user. It breaks down into roughly 4 areas to consider: Generation, Transmission, Distribution, and Consumption. We, as consumers, can see and feel that last portion, and that is certainly the area that has received the most attention. However, in reality, we should care about and pay attention to what is happening with the other three. These areas will have far greater impact on the availability, reliability, and stability of electricity to power our lives. What’s this? Clean, reliable electricity? Don’t we already have that? 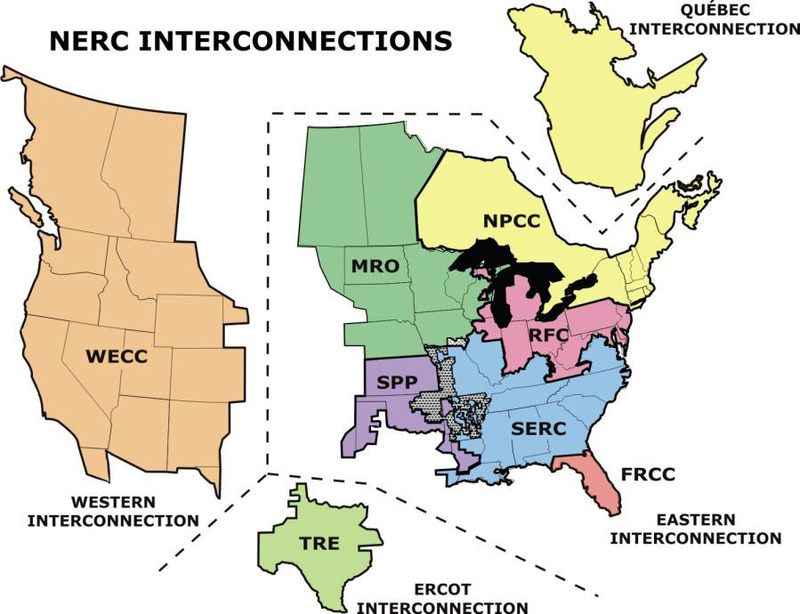 The electricity system in the US is incredibly complex. Most of us have little appreciation for shat it takes to deliver electricity to that plug in the wall. The system is essentially on demand. There is virtually no storage of energy, and yet balance is maintained. As electricity is demanded, it is created, transported and delivered to the consumer. The fact that large swings in demand do not cause blackouts, brownouts, or fried equipment on a regular basis is an engineering marvel that is one of the major technical achievements of the 20th century. That fact that it is done with technology little changed since the 19th century is miraculous. The initiative known as SmartGrid is probably going to impact our country almost as much as the original electrification efforts of the early 20th century. Ironically, if it succeeds, most of us will perceive little change to their daily relationship with electricity. Plug in an appliance and electricity will flow. BUT, these changes will ensure that flow is reliable, clean and safe. AND that the new plug-in electric vehicle in the garage is ready to go whenever and where ever the proud new owner chooses to take it. The air will be a little cleaner, and no warmer than it was at the start of this project. If the initiative fails at its objectives, however, the outlook is much more bleak out at the edge of the grid. The choices in this country will be painful and expensive. The potential negative impacts on the environment and the economy are enormous and our children will face a future with fewer options. So, SmartGrid must succeed. Succeed at what though? Briefly, here are the four areas and their issues. The demand basis upon which we operate and the societal desire to move to more sustainable generation options make managing the generation of electiricy expremely complex. Today, the energy mix in this country is primarily coal, nuclear, and hydro (when its available) for baseload demand. Natural gas is used to handle the variable demand. Solar, wind, and other alternate energy options make up a very small percent of the total available electricity generation. However, in markets where as little as 4% of generation comes from wind, the inherent volatility can already have major impacts on both the volatility of energy pricing as well as total supply available on the grid. The current ability of the grid to add and shed the electrical demand is too slow and too limited to handle more than a few % of these volatile energy sources. 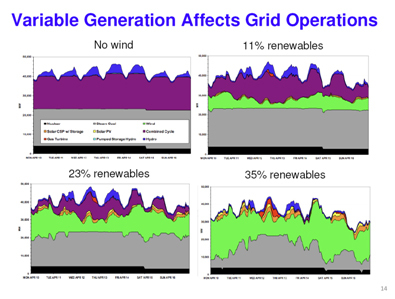 Today, in markets where significant wind or solar generation is a part of the mix, the utility must also maintain significant fossil generation (usually natural gas) spinning in reserve to back-up the supply. This back up power is idling like your car, burning fuel, but not actually going anywhere so that it is immediately available should clouds pass between sun and solar panels, or the wind change speed. On average, it requires the utility to run about 85% of the load in reserve. This means that the goal of reducing emissions is almost completely missed. In utility speak, the phrase T&D commonly crops up and refers to transmission and distribution. An analogy related to our road system helps to understand how they relate. Transmission can be thought of as the insterstate highway system where large numbers of vehicles are moving at high rates of speed over long distances. In electricity, these are those huge high voltage lines that stretch into the distance between big power stations and the population centers. Distribution is the local road system. It delivers electricity from the neighborhood substation to each house. Those high voltage lines that crisscross the landscape and the huge switch yards outside the power plants are the primary components. In order to allow regions to be isolated, there is minimal interface of these transmission lines from one region of the country to another. This was a conscious decision on the part of the original designers of the grid system to prevent failures in one region from propagating further. The transmision system include DC and AC current as well as transformers and capacitor banks to step voltage up or down as required. Currently, there are few sensors or communications from the large switchyards with one another or with a central authority. Thus, problems can develop over the course of time. These issues can cause huge cascading effects that darken entire regions of the country. In addition, there is very limited sensing data associated with the high voltage lines. An issue at a single tower can require significant resources to track down and repair. The local switchyard manages the step down of voltage from those high voltage lines to a level that is safe to distribute into a neighborhood where additional pole based transformers and capacitors manage the remaining voltage and demand control into each building. Most utilities cannot determine where a fault occurs and must wait for consumers to contact them regarding outages to find and correct issues with the power supply. Ultimately, all of this infrastructure exists to get power to the end-user. The consumers break down into roughly three types: commercial, industrial, and residential. This is where significant variation in usage creates huge spikes in demand. The most notable development was that of air conditioning. As air conditioning has become common, electricity demand spikes on hot summer days have continued to soar. Addition of electronic gadgets of every nature, big refrigerators and freezers, and hot water heaters have increased baseload demand as well. The final twist is that of consumers as producers. Increasingly, consumers of all types are looking at the possibility of generating electricity. Allowing excess electricity to flow back into the grid from the edge requires some fundamental changes to the way the systems are designed to operate. Over the next few articles, I’ll explore each of these areas in more detail.